Protyl Ag™ combines the wound healing and antimicrobial benefits of hyCURE and silver oxide to provide a favorable moist wound environment for wound healing. Protyl Ag is an absorbent hydrolyzed collagen gel for the management of exudative wounds. It provides a physiologically favorable moist wound environment for wound healing. Protyl Ag absorbs excess wound exudate. Protyl Ag is made from natural materials that contain the proteins and amino acids that constitute the major building blocks of normal skin and connective tissue as well as silver as preservative to control bacterial growth within the gel. 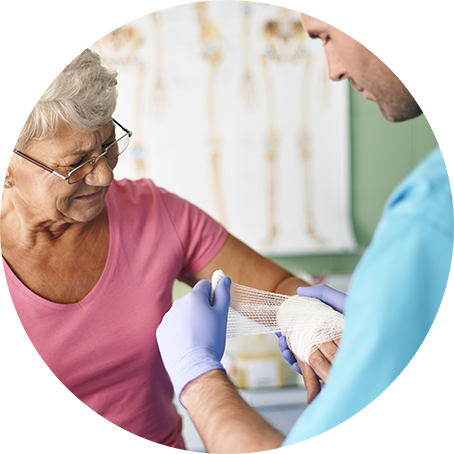 Protyl Ag provides a physiologically favorable environment that encourages wound healing and conforms to the wound site. It is easy to use, biocompatible and biodegradable. Protyl Ag supports natural autolysis by rehydrating and softening necrotic tissue and eschar thereby encouraging autolytic debridement. The silver preservative in the dressing controls microbial growth within the gel. Protyl Ag™ is available at pharmacies nationwide. For assistance finding this medication, please contact us.